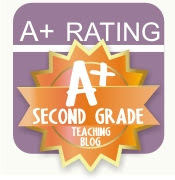 I created this product to stimulate the brain cells and get kids thinking about writing. And what’s better than writing about something fun that they have done. This activity is called Summer Snaps, short for Summer Snapshots. 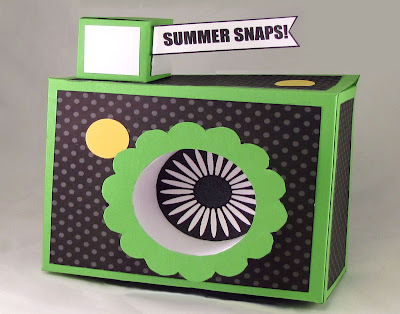 And what I ask the kids to do is create a camera as a fun motivational tool, and then imagine what they would have taken pictures of over the past summer. I want them to “take” lots of “photos” with their pretend camera. 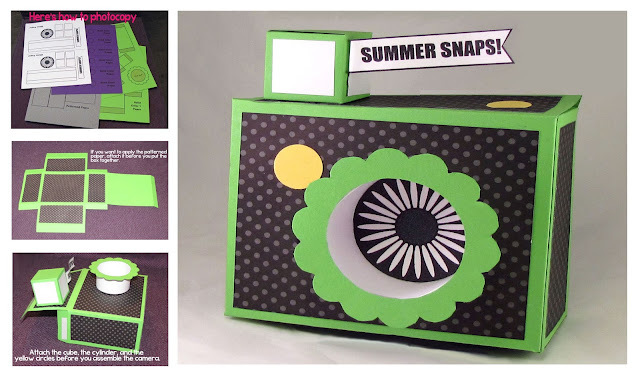 Summer Snaps has 3 different types of cameras you can make. 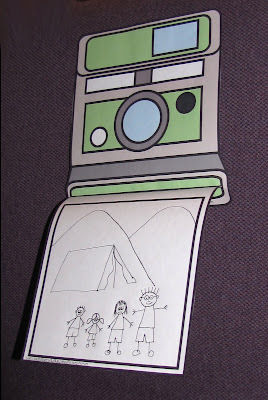 There’s a 3D paper camera which is totally adorable, but can be time consuming, especially for younger children. But it works great as a buddy project, or with slightly older students. There are two other 2D cameras made from coloured paper. If you are really tight on time, they can even just colour a blackline master with a camera. After they make their camera its fun to let them go out on the playground and take pictures of themselves with their paper camera. 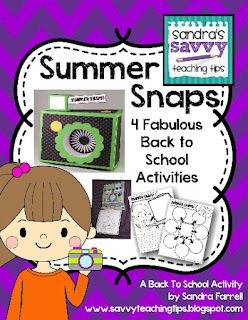 The second part of this activity involves brainstorming what their favourite activities of the past summer have been. They can draw little pictures in the circles on this worksheet. Younger children can simply draw and you can scribe their answers. Older children can write a sentence under their picture. And if you have time they can colour their worksheet as well like in the example below. 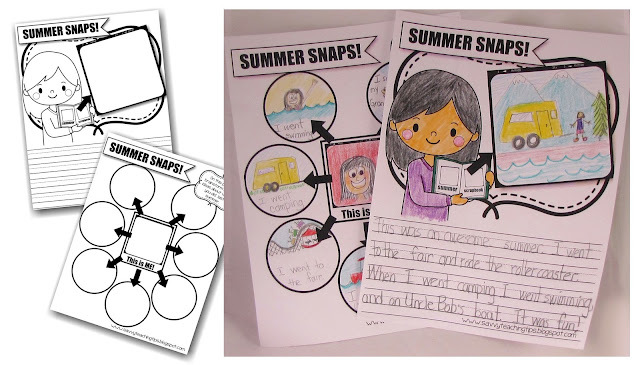 And finally get them to pick their favourite Summer Snap and draw it again on the larger worksheet. Then they can write descriptive sentences below it. Last year I just had the kids write sentences about several of their summer snaps (as in the photo above) but this year I am going to work on getting them to answer some probing questions. 2 Who did you see? 3 What did you see? 4 What did you hear? 5 What did you smell? 6 Did you make any new friends? 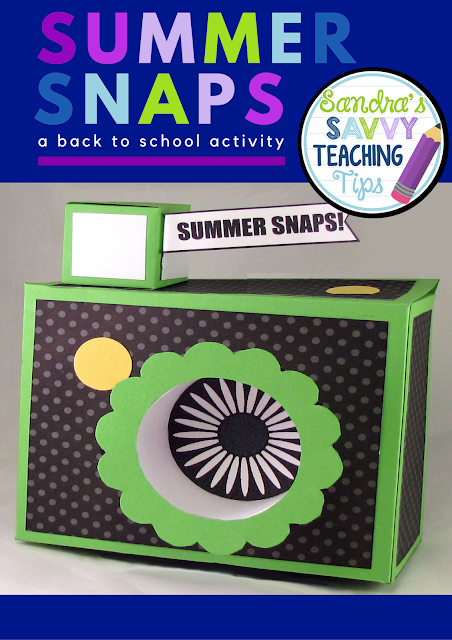 7 What was the best part of your summer snap? Also included are a simple colouring and drawing activity which makes a great beginning of the year Bulletin Board, especially for younger students. You could pair it with a writing page for older students. This is adorable! 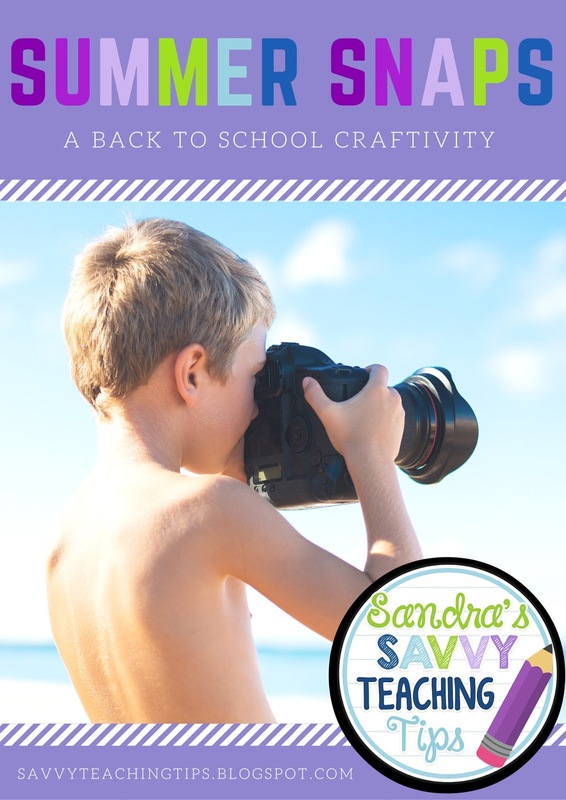 I love the camera and see the kids using them all year to capture "photos" of events and activities throughout the year. Thanks for sharing. This is very cute! I went right to your store to check it out. The first question that popped into my head was wondering how difficult it might be to make the camera. Once I came back to the blog post, I saw many more pictures that revealed just how easy this project could be. It's clever and engaging. I believe it would encourage a great first day writing sample. Great post! This is absolutely adorable! I am a photo nerd and love the camera! My students would have so much fun with this activity. Thanks for sharing!